Cowlitz County is home to one active municipal waste landfill, a compost facility, a transfer station, several recycling facilities, a drop box facility, and multiple closed landfills and disposal sites. The Environmental Health Unit (EHU) of the Health & Human Services Departments is responsible for regulating and permitting these facilities. All are regulated under the State of Washington Administrative Codes (WAC) 173-350, 173-351, 173-304, as well as Cowlitz County Code (CCC) 15.30. Before it was permitted for receiving municipal waste, Headquarters landfill was developed by Weyerhaeuser as a Limited Purpose Landfill (LPL) regulated under WAC 173-350. It was originally constructed to accept timber and industrial waste, as well as construction, demolition, and commercial waste. In 2011, Cowlitz County updated its Solid Waste Management Plan to include the facility. Negotiations to purchase the landfill from Weyerhaeuser began soon after. In 2013, the landfill (now owned by the County) was re-permitted as a Municipal Solid Waste Landfill (MSWL), regulated under WAC 173-351. The County also owns the Tenant Way landfill, located just outside of the city of Longview. 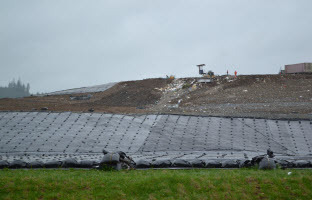 This landfill was developed in 1974 and is comprised of site A and site B. Site A was developed and used primarily to dispose of municipal solid waste from 1974-1991, and it reached final closure in 1992. Site B construction began in 1991 and was also primarily used to deposit municipal solid waste. Site B was capped in 2015 and reached post-closure care status in July of 2017. The total area of the landfill is 100 acres and has approximately 2,417,600 cubic yards of solid waste.